This community master plan provides a mix of jobs, housing, retail, open space, and community serving amenities for Southeast Bakersfield. 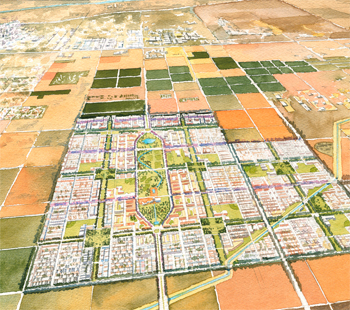 The plan incorporates a high level of walkability into its design that has yet to be experienced in other contemporary Bakersfield neighborhoods. The plan intricately weaves a variety of private land uses with public amenities and open space to ensure vital, active, and safe neighborhoods. 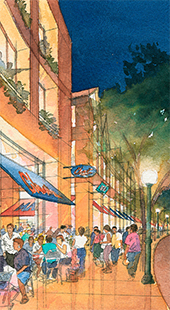 The plan comprises 9,700 residential units ranging from single family to live work units. Mixed use integrated with the housing faces public spaces. Approximately 160 acres are reserved as an employment center. Neighborhood elementary schools, middle schools, and one high school populate this new community. The plan was prepared as an offer for land being sold by the City of Bakersfield for mixed use development.